Cardio-oncology is a recently developed field in cardiology aimed at significantly reducing cardiovascular morbidity and mortality and improving quality of life in cancer survivors. Cancer survival rates have been constantly increasing, mainly because of the advent of new, more potent and targeted therapies. However, many of the new therapies – along with some of the older chemotherapeutic regimens such as anthracyclines – are potentially cardiotoxic, which is reflected increasingly frequently in the published literature. Cardiotoxicity adversely affects prognosis in cancer patients, thus its prevention and treatment are crucial to improve quality and standards of care. This review aims to explore the existing literature relating to chemotherapy- and radiotherapy-induced cardiotoxicity. An overview of the imaging modalities for the identification of cardiotoxicity and therapies for its prevention and management is also provided. The authors have no conflicts of interest to declare. AK and AN contributed equally to this work. Anthracycline-induced cardiotoxicity was first reported in early 1970s.1 Since then, there has been increasing recognition of its association with poor prognosis and survival.2 More recently, while new targeted and more effective molecules have been introduced in clinical oncology, cardiotoxic effects – which are not uncommon – may potentially outweigh theoretical clinical benefit. Overall, the management of patients with cancer is complex and requires a multidisciplinary team approach involving oncologists, surgeons, radiologists and clinical cardiologists. The aim of this review is to provide an overview of chemotherapy and radiotherapy-related cardiotoxicity, with a special focus on diagnosis, prevention and management. Anti-cancer treatment is associated with serious cardiovascular adverse events, including arterial and pulmonary hypertension, supraventricular and ventricular arrhythmias, systolic and diastolic cardiac dysfunction and coronary artery disease. It has been postulated that chemotherapy- and radiotherapy-related endothelial dysfunction, thrombogenesis and myocardial injury may partly explain these cardiovascular complications. Radiotherapy is associated with coronary atherosclerosis – especially in the coronary ostia – and a higher risk for acute coronary syndromes. Following radiotherapy for Hodgkin lymphoma, the cumulative incidence of coronary artery disease is high (approximately 20 %), even 40 after years.38 Therefore, long-term follow-up and close monitoring for several years after radiotherapy is reasonable. Arterial hypertension is frequently reported in patients receiving VEGF inhibitors (11–45 %). Bevacizumab and sunitinib increase the risk of arterial hypertension or aggravation of pre-existing hypertension – possibly via inhibition of angiogenesis, reduction in nitric oxide and increase in endothelin-1 levels along with glomerular injury and renal microangiopathy.11 Furthermore, the inhibition of beta-type platelet-derived growth factor receptor by sunitinib has been associated with microcirculatory dysfunction. Autopsy studies have suggested that mediastinal irradiation for a wide range of cancers may potentially adversely affect the heart valves.21 Diffuse or focal fibrosis, thickening and calcification of the valves as a result of upregulation of fibrogenic growth factors, and increased formation of osteogenic factors have been described. Interestingly, in contrast to rheumatic valve disease, radiation does not usually affect the tips of the valves. The prevalence of radiation-induced valve disease ranges from 2 to 37 % for Hodgkin lymphoma and from 0.5 to 4.2 % for breast cancer.21 A long latent interval between radiation exposure and valve disease (usually >10 years) has been reported.21 It is important to note that in immunocompromised patients a high level of awareness of infective endocarditis is particularly warranted, especially when valve regurgitation is discovered during or after chemotherapy. Finally, chemotherapy-induced cardiotoxicity may associate with severe functional mitral valve regurgitation, which should be promptly diagnosed and treated. Cyclophosphamide- and ifosfamide-induced cardiotoxicity is dose dependent and usually presents few days after treatment. High doses (>140 mg/kg) are considered very cardiotoxic. Although platinum-based therapies have been associated with decompensated heart failure, pre-existing myocardial dysfunction and volume overload during platinum administration are probably responsible for heart failure decompensation rather than platinum per se.36 New immunotherapy agents such as ipilimumab (an anti-cytotoxic T-lymphocyte-associated protein 4 monoclonal antibody) and nivolumab (an anti-programmed death 1 monoclonal antibody) are usually co-administered for the treatment of melanoma and have been estimated to induce resistant myocarditis in approximately 1 % of patients.37 Interestingly, several chemotherapeutic agents have been linked with left ventricular diastolic dysfunction, with a benign prognosis in the majority of cases. A baseline work-up including medical history, clinical examination, laboratory tests, an electrocardiogram and an echocardiogram with speckle tracking should precede a potentially cardiotoxic chemotherapy (Figure 1).6,41 Predictive models can be used to assess the risk of cardiotoxicity on the basis of the baseline patient characteristics. Factors that may predispose to cardiac adverse events include a previous diagnosis of structural heart disease, the presence of traditional cardiovascular risk factors, previous or future exposure to cardiotoxic therapy and older age (Table 3). At present, the most commonly used parameter for the evaluation of the systolic function is the EF. However, intra-observer and inter-observer variability for 2D EF measurements using the Simpson’s biplane method is not negligible. In addition, small but significant EF changes (≤10 %) might be missed by 2D but usually not by 3D echo.43 Obstacles such as poor image quality resulting from rapid heart rate, increased cardiac translocation, and respiratory interference might be overcome with intravenous contrast infusion. Radionuclide ventriculography or multigate acquisition scan (MUGA) is another relatively accurate and alternative to heart echo imaging modality to detect even asymptomatic left ventricular dysfunction in patients receiving chemotherapy. MUGA has been previously used to evaluate left ventricular function after anthracycline administration, and many of the recommendations for the monitoring and management of anthracycline-induced cardiotoxicity are based on MUGA findings.44 Cardiac MRI is another imaging modality that can precisely identify early signs of cardiotoxicity (i.e. inflammation and oedema) and assess ventricular volumes and function. The extent of late gadolinium enhancement may identify patients with worse prognosis, whereas diffuse fibrosis in T1 mapping can predict late anthracycline cardiotoxicity.45 Furthermore, cardiac MRI is probably the best technique for the diagnosis of cardiac tumours and radiotherapy-related pericardial disease. 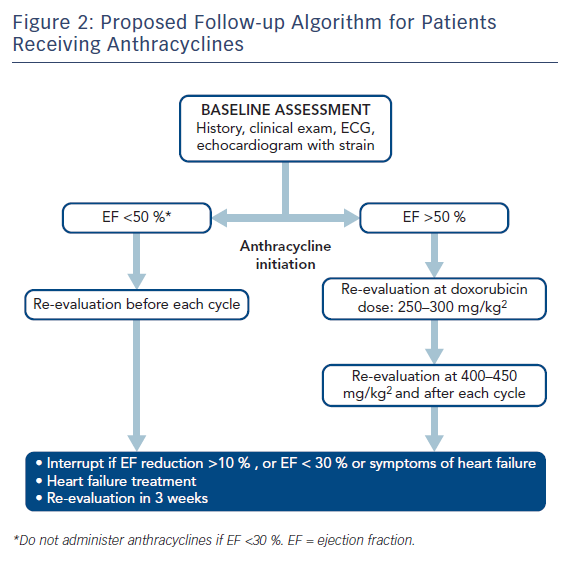 For patients receiving anthracyclines and/or trastuzumab after baseline clinical evaluation and heart echo, routine clinical follow-ups and heart echos are recommended every 3 months for the first year of therapy.41 For anthracyclines in particular, a repeat echo is also advisable at a cumulative dose of 240 mg/m2 or even earlier if clinical symptoms and/or an increase in cardiac enzymes is observed (Figure 2). For higher anthracycline doses, routine echocardiograms are recommended before each anthracycline cycle. For less cardiotoxic chemotherapy, follow-up assessments should be individualised. The management of acute coronary syndromes in patients with cancer is challenging. A recent study from the Mayo Clinic has shown that 10 % of patients presenting with ST-elevation MI (STEMI) are patients with cancer. Interestingly, primary percutaneous coronary intervention results in similar survival benefit in those patients compared with the general population with STEMI.49 The administration and duration of dual antiplatelet therapy must be individualised after balancing ischaemic and bleeding risk. The type of cancer and its prognosis and management should also be taken into account before dual antiplatelet therapy is given. In general, the duration of dual antiplatelet therapy should be the shortest time possible. In patients with severe thrombocytopaenia (platelet count <50.000/μL) the bleeding risk increases exponentially. According to current guidelines, dual antiplatelet therapy can be considered with caution when platelet count is higher than 30.000/μL, whereas aspirin as monotherapy is recommended when platelet count is between 10.000 and 30.000/μL.50 Radial access is associated with less bleeding and better clinical outcomes in patients with acute coronary syndromes. Extrapolating these findings in patients with cancer, a radial approach must be the preferred route for these patients too, because their bleeding risk is much higher than in the general population. Cardio-oncology is increasingly becoming part of routine clinical practice. Alongside oncologists and cardiologists it requires the collaboration of several medical specialties, with this multidisciplinary approach contributing to improved outcomes in cancer patients in the contemporary era. The goal of cardio-oncology is to accomplish the prevention, early recognition and management of cardiotoxicity, but there are still a number of questions to be answered to improve patient prognosis and quality of life. On-going and future research is expected to elucidate the exact mechanisms involved in chemotherapy-induced cardiotoxicity and to accurately identify the genetic and molecular profiles underlying those mechanisms and making the heart more vulnerable to chemotherapy. Von Hoff DD, Layard MW, Basa P, et al. Risk factors for doxorubicin-induced congestive heart failure. Ann Intern Med 1979;91:710–7. Ferlay J, Steliarova-Foucher E, Lortet-Tieulent J, et al. Cancer incidence and mortality patterns in Europe: estimates for 40 countries in 2012. Eur J Cancer 2013;49:1374–403. Yeh ET, Bickford CL. Cardiovascular complications of cancer therapy. J Am Coll Cardiol 2009;53:2231–47. Clark RA, Berry NM, Chowdhury MH, et al. Heart failure following cancer treatment: characteristics, survival and mortality of a linked health data analysis. Intern Med J 2016;46:1297–306. Raschi E, De Ponti F. Cardiovascular toxicity of anticancer-targeted therapy: emerging issues in the era of cardio-oncology. Intern Emerg Med 2012;7:113–31. Koene RJ, Prizment AE, Blaes A, Konety SH. Shared risk factors in cardiovascular disease and cancer. Circulation 2016;133:1104–14. Zamorano JL, Lancellotti P, Rodriguez Muñoz D, et al. 2016 ESC position paper on cancer treatments and cardiovascular toxicity developed under the auspices of the ESC Committee for Practice Guidelines. Eur Heart J 2016;37:2768–01. Ewer MS, Ewer SM. Cardiotoxicity of anticancer treatments. Nat Rev Cardiol 2015;12:547–58. Todaro MC, Oreto L, Qamar R, et al. Cardioncology: state of the heart. Int J Cardiol 2013;168:680–7. Kosmas C, Kallistratos MS, Kopterides P, et al. Cardiotoxicity of fluoropyrimidines in different schedules of administration: a prospective study. J Cancer Res Clin Oncol 2008;134:75–82. Ewer MS, Ewer SM. Cardiotoxicity of anticancer treatments: what the cardiologist needs to know. Nat Rev Cardiol 2010;7:564–75. Herrmann J, Yang EH ,Iliescu CA, et al. Vascular toxicities of cancer therapies the old and the new – an evolving avenue. Wiczer TE, Levine LB, Brumbaugh J, et al. Cumulative incidence, risk factors, and management of atrial fibrillation in patients receiving ibrutinib. Blood Adv 2017;1:1739–48. Setteyova L, Bacharova L, Mladosievicova B. QT prolongation due to targeted anticancer therapy. Oncoreview 2016;6:A103-112. Chang HM, Moudgil R, Scarabelli T, et al. Cardiovascular complications of cancer therapy. J Am Coll Cardiol. 2017;70:2536–51. Montani D, Bergot E, Günther S, et al. Pulmonary arterial hypertension in patients treated by dasatinib. Circulation 2012;125:2128–37. Chari A, Hajje D. Case series discussion of cardiac and vascular events following carfilzomib treatment: possible mechanism, screening, and monitoring. BMC Cancer. 2014;14:915. Villa A, Mazzola AA, Ghio S, et al. Reversible pulmonary hypertension related to thalidomide treatment for multiple myeloma. Case Rep Oncol. 2011;4(3):487-9. Li W, Cornell RF, Lenihan D, et al. Cardiovascular complications of novel multiple myeloma treatments. Circulation 2016;133:908–12. Larocca A, Cavallo F, Bringhen S, et al. Aspirin or enoxaparin thromboprophylaxis for patients with newly diagnosed multiple myeloma treated with lenalidomide. Blood 2012;119:933–9. Gujral DM, Lloyd G, Bhattacharyya S. Radiation-induced valvular heart disease. Heart 2016;102:269–76. Toyofuku M, Okimoto T, Tadehara F, et al. Cardiac disease late after chest radiotherapy for Hodgkin’s disease. Jpn Circ J 1999;63:803–5. Kane GC, Edie RN, Mannion JD. Delayed appearance of effusive-constrictive pericarditis after radiation for Hodgkin lymphoma. Ann Intern Med 1996;124:534–5. Cardinale D, Colombo A, Bacchiani G, et al. Early detection of anthracycline cardiotoxicity and improvement with heart failure therapy. Circulation 2015;131:1981–8. Shan K, Lincoff AM, Young JB. Anthracycline-induced cardiotoxicity. Ann Intern Med 1996;125:47–58. Yeh ET, Chang HM. Oncocardiology – past, present, and future. JAMA Cardiol 2016;1:1066–72. Curigliano G, Cardinale D, Suter T, et al. Cardiovascular toxicity induced by chemotherapy, targeted agents and radiotherapy: ESMO clinical practice guidelines. Ann Oncol 2012:23(Suppl 7): vii155–66. Fukuda A, Tahara K, Hane Y, et al. Comparison of the adverse event profiles of conventional and liposomal formulations of doxorubicin using the FDA adverse event reporting system. PLoS One 2017;12:e0185654. Moslehi JJ. Cardiovascular toxic effects of targeted cancer therapies. N Engl J Med 2016;375:1457–67. Eschenhagen T, Force T, Ewer M, et al. Cardiovascular side effects of cancer therapies: a position statement from the Heart Failure Association of the European Society of Cardiology. Eur J Heart Fail 2011;13:1–10. Pondé NF, Lambertini M, de Azambuja E. Twenty years of anti-HER2 therapy-associated cardiotoxicity. ESMO Open 2016;1:e000073. Ky B, Vejpongsa P, Yeh ETH, Force T, Moslehi JJ. Emerging paradigms in cardiomyopathies associated with cancer therapies. Circ Res. 2013;113(6):754–64. Ghatalia P, Morgan CJ, Je Y, et al. Congestive heart failure with vascular endothelial growth factor receptor tyrosine kinase inhibitors. Crit Rev Oncol Hematol 2015;94:228–37. Ky B, Vejpongsa P, Yeh ET, et al. Emerging paradigms in cardiomyopathies associated with cancer therapies. Circ Res 2013;113:754–64. Gollerkeri A, Harrold L, Rose M, et al. Use of paclitaxel in patients with pre-existing cardiomyopathy: a review of our experience. Int J Cancer 2001;93:139–41. Johnson D, Balko J, Compton M, et al. Fulminant myocarditis with combination immune checkpoint blockade. N Engl J Med 2016;375:1749–55. Bloom MW, Hamo CE, Cardinale D, et al. Cancer therapy-related cardiac dysfunction and heart failure: Part 1: Definitions, pathophysiology, risk factors, and imaging. Circ Heart Fail 2016;9:e002661. van Nimwegen FA, Schaapveld M, Janus CPM, et al. Cardiovascular disease after Hodgkin lymphoma treatment: 40-year disease risk. JAMA Intern Med 2015;175:1007–17. Gujral DM, Chahal N, Senior R, et al. Radiation-induced carotid artery atherosclerosis. Radiother Oncol 2014;110:31–8. Herrmann J, Lerman A, Sandhu NP, et al. 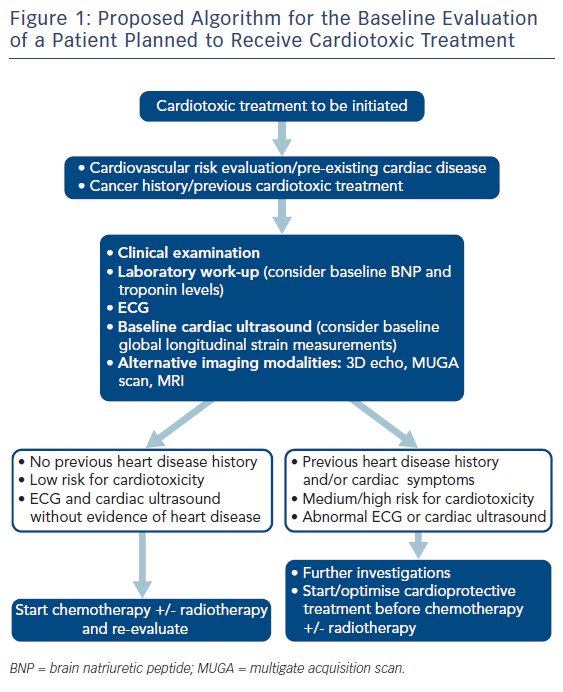 Evaluation and management of patients with heart disease and cancer: cardio-oncology. Mayo Clin Proc 2014;89:1287–306. Cardinale D, Sandri MT. Role of biomarkers in chemotherapy-induced cardiotoxicity. Prog Cardiovasc Dis 2010;53:121–29. Plana JC, Galderisi M, Barac A, et al. Expert Consensus for multimodality imaging evaluation of adult patients during and after cancer therapy: A report from the American Society of Echocardiography and the European Association of Cardiovascular Imaging. Eur Heart J Cardiovasc Imaging 2014;10:1063–93. Choi BW, Berger HJ, Schwartz PE, et al. Serial radionuclide assessment of doxorubicin cardiotoxicity in cancer patients with abnormal baseline resting left ventricular performance. Am Heart J 1983;106:638–43. Tham EB, Haykowsky MJ, Chow K, et al. Diffuse myocardial fibrosis by T1-mapping in children with subclinical anthracycline cardiotoxicity: relationship to exercise capacity, cumulative dose and remodeling. J Cardiovasc Magn Resonan 2013;15:48. Hamo CE, Bloom MW, Cardinale D, et al. Cancer therapy-related cardiac dysfunction and heart failure: Part 2: Prevention, treatment, guidelines, and future directions. Circ Heart Fail 2016;9:e002843. Sawaya H, Sebag IA, Plana JC, et al. Assessment of echocardiography and bio- markers for the extended prediction of cardiotoxicity in patients treated with anthracyclines, taxanes, and trastuzumab. Circ Cardiovasc Imaging 2012;5:596–603. Jones AL, Barlow M, Barrett-Lee PJ, et al. 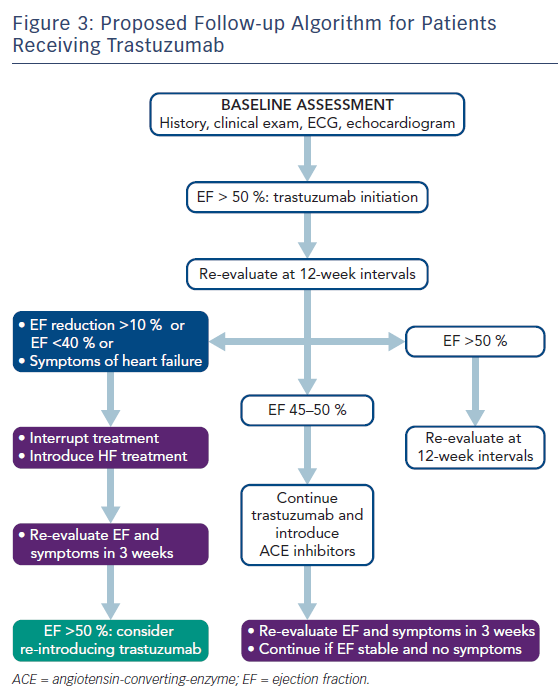 Management of cardiac health in trastuzumab-treated patients with breast cancer: updated United Kingdom National Cancer Research Institute recommendations for monitoring. Br J Cancer 2009;100:684–92. Wang F, Gulati R, Lennon R, et al. Cancer history portends worse acute and Long-term noncardiac (but not cardiac) mortality after primary percutaneous coronary intervention for acute ST-segment elevation myocardial infarction. Mayo Clin Proc 2016;91:1680-1692. Iliescu CA, Grines CL, Herrmann J, et al. SCAI expert consensus statement: Evaluation, management, and special considerations of cardio-oncology patients in the cardiac catheterization laboratory (endorsed by the Cardiological Society of India, and Sociedad Latino Americana de Cardiologia intervencionista). Catheter Cardiovasc Interv 2016;87:E202–23. Pituskin E, Mackey JR, Koshman S, et al. Multidisciplinary approach to novel therapies in cardio-oncology research (MANTICORE 101–Breast): A randomized trial for the prevention of trastuzumab-associated cardiotoxicity. J Clin Oncol 2017;35:870–7. Cardinale D, Colombo A, Sandri MT, et al. Prevention of high-dose chemotherapy-induced cardiotoxicity in high-risk patients by angiotensin-converting enzyme inhibition. Circulation 2006;114:2474–81. Gulati G, Heck SL, Ree AH, et al. Prevention of cardiac dysfunction during adjuvant breast cancer therapy (PRADA): a 2 × 2 factorial, randomized, placebo-controlled, double-blind clinical trial of candesartan and metoprolol. Eur Heart J 2016;37:1671–80. Boekhout AH, Gietema JA, Milojkovic Kerklaan B, et al. Angiotensin II–receptor inhibition with candesartan to prevent trastuzumab-related cardiotoxic effects in patients with early breast cancer: A randomized clinical trial. JAMA Oncol 2016;2:1030–7. Seicean S, Seicean A, Plana JC, et al. Effect of statin therapy on the risk for incident heart failure in patients with breast cancer receiving anthracycline chemotherapy: an observational clinical cohort study. J Am Coll Cardiol 2012;60:2384–90. Payne DL, Nohria A. Prevention of chemotherapy induced cardiomyopathy. Curr Heart Fail Rep 2017;14:398–403.